Oms, Endo, Perio Visions, DentalVision Group Practice Edition & Enterprise! 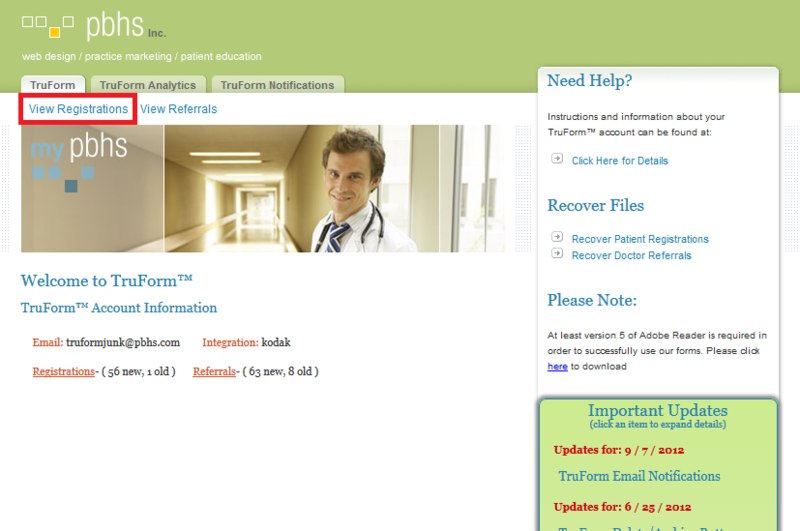 This document includes ALL fields that integrate between TruForm and Henry Schein. If your custom form is setup correctly, items listed below will populate within your software. Note, if you have additional fields that are NOT listed below, you can manual enter them into your patients account once integration is completed! If you use our standard form below, the sections listed below are already integrated! *IF YOU ARE USING A CUSTOM FORM: Patient Address/ City/ State must be split out into its own fields in order to integrate correctly. *IF YOU ARE USING A CUSTOM FORM:Dentist/Doctor/Referred By/Nearest Relative Names on the form must be split out into first name last name in order to integrate correctly. Emergency Name must be one field (can't be split into first name last name fields, or else it will not integrate). *IF YOU ARE USING A CUSTOM FORM: Responsible Name on the form must be split out into first name last name in order to integrate correctly. Each insurance type (primary medical, primary dental, secondary medical, secondary dental must be separated into its own area for each question below in order to integrate correctly. All Address/ City/ State must be split out into its own fields in order to integrate correctly. Insured Name on the form must be split out into first name last name in order to integrate correctly. *Please note: If the patient does not type in exact spelling of insurance name that matches within your system- NO insurance will integrate! In most cases the entire Insurance section WILL NOT INTEGRATE! This entire section will not integrate. Patient Demographic (reviewed above) - some items will not integrate. Responsible Party fields. (reviewed above) - some items will not integrate. HEALTH HISTORY INFORMATION DOES NOT INTEGRATE. YOU CAN MANUALLY FILL IN THE NEEDED HEALTH HISTORY FIELDS BY LOCATING THE FORM IN THE PATIENTS RECORD. A Henry Schein representative will need to assist you in adding or modifying your TruForm Integration Credentials (PBHS does not have access to this). Please contact Henry Schein Support using the information below. If you are experiencing problems (software/computer is freezing and/or it takes a long period of time for you to pull in your patient truforms) pulling patient registrations into your practice software, there are a few steps you can take to resolve them. The best step to take first is to clear your software queue. This isn't the list of patients that appear within your software. This is the list of patients on our server that need to go to the list within your software. A pop-up window will appear, click "OK" to confirm you would like to Clear the Queue *this will only delete forms within your software list/queue, forms within MyPBHS stay as-is unless you delete them individually. The queue will clear so you can now poll correctly- click "OK"
Now go to your software and retry pulling your patient truforms. You should notice a difference! Follow the instructions below if you need to reconvert a truform through your software! 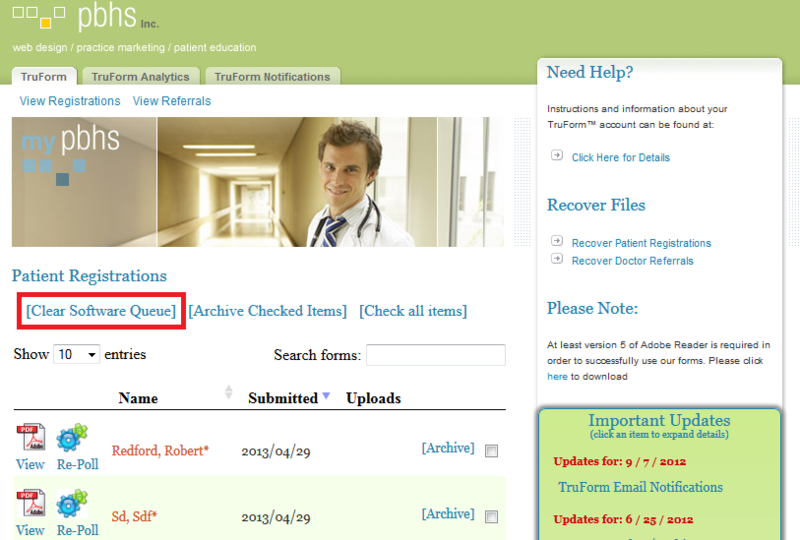 Within your Henry Schein software, you should see the patient listed in your queue once you do a manual poll!